As with most self defense, youth self defense begins with responsibility and preparedness. Educating children of potential threats that could cause them harm including relatives, family friends, teachers and even officers of the law could save their life. In most cases children are abducted or abused by someone they know or has gained your child’s trust. 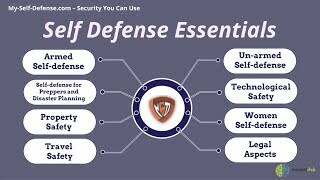 There are many reasons your child may need to implement some youth self defense techniques and devices to keep themselves safe. From bullies to kidnappers there is an ever growing number of threats that a child may encounter on a day to day basis. As a parent there is not a lot you can do when you are not with your child other than prepare them for dangerous situations. Whenever possible a child should first be focused on escape and evasion techniques. Teaching a child to get away from the danger should be your first priority when teaching youth self defence to your child. Unlike an adult, a child can not legally utilize most self defense equipment. Items such as pepper spray, stun guns, tasers and other self defense devices are illegal for children under the age of 18 to purchase or use in many places. This gives your child a huge disadvantage when attempting to protect themselves. Probably the most useful item a child can carry to help ward off danger would be a personal alarm . A personal alarm will alert others that a child may be threatened and need help. Screaming help as loud as possible over and over can also be effective to attract attention. One of the best options when teaching a child to defend themselves is self defense classes. Are you interested in keeping your child safe? Get them involved in martial arts . Click the link! The site you will visit is dedicated to all types of martial arts from karate to Aikido and even provides tips on choosing a good school.